Pete was thrilled when Vickie and Brian, owners of Bellarose event venue in Virginia, asked him to build a romantic honeymoon suite for couples who wed on the estate. Pete integrated colonial-style architectural elements to seamlessly blend the treehouse with the property's historic structures. Tight-knot cedar siding gives the facade a golden glow, and the red metal roof adds charm. A sweeping staircase leads to the front door, which is flanked by colonial-style columns. 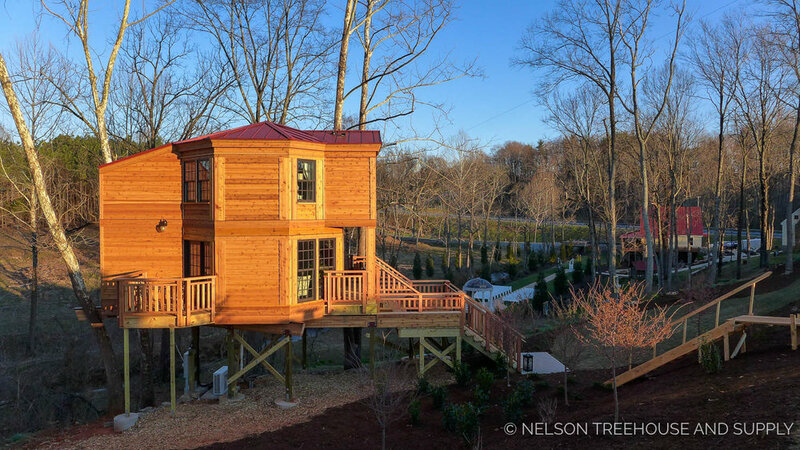 A combination of posts and trees support this 563-square-foot treehouse. Its interior drywall, fireplace, and standalone tub made for an unusually heavy treehouse that required the additional support of posts. The front deck offers stunning views of the surrounding forest, hills, and creek. Inside, the first floor contains ample seating space, a stone fireplace, and wide windows that let in plenty of sunlight. Vickie and Brian asked the crew to add drywall so that they could paint the surfaces. Moulding adds elegance and resonates with the colonial style of the treehouse. A small porch off the back of the first floor holds a sweet seating area. An ethereal mural of trees and birds covers the walls around the staircase and sleeping loft. The bedroom loft holds a plush bed, seating area, armoir, and bathroom. A standalone bathtub makes for a spa-like bathroom. 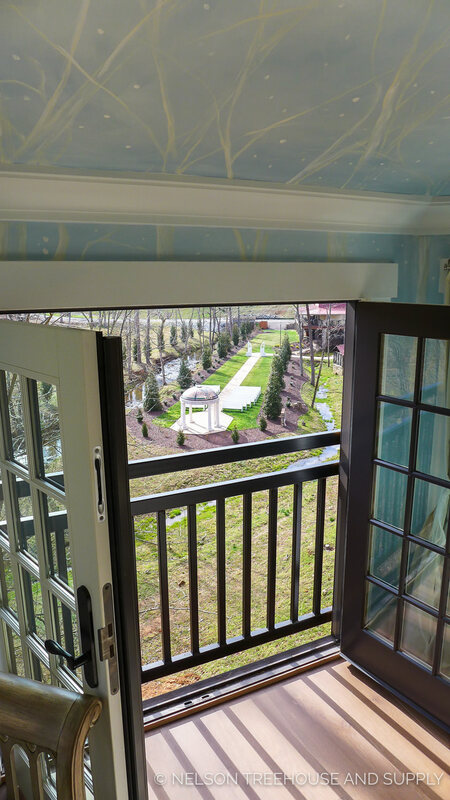 French doors across the bed open to stunning views of the creekside rotunda below. 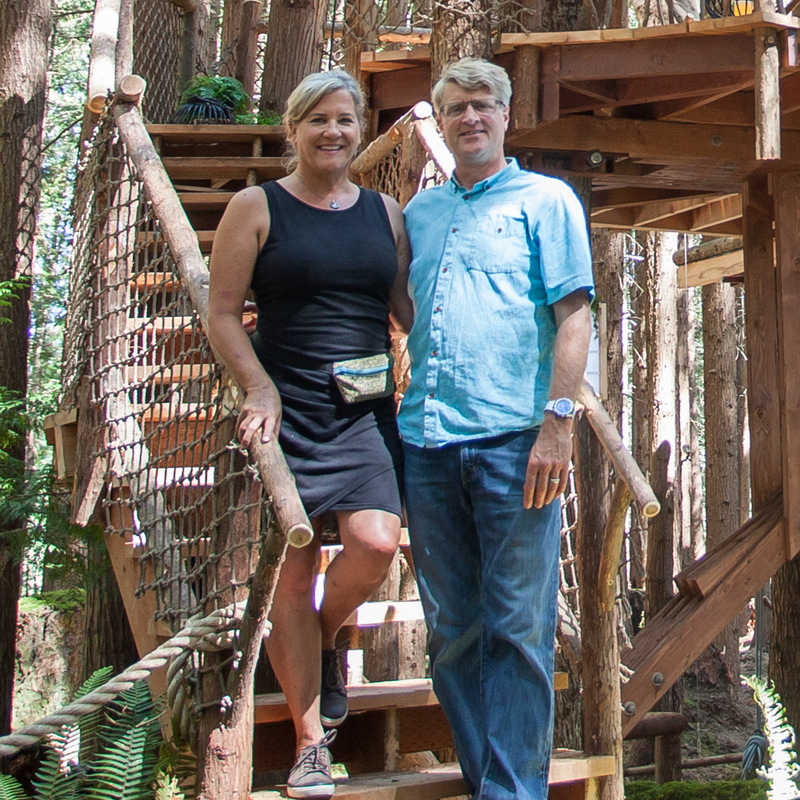 What's more romantic than a treehouse for honeymoon lodging? Thank you for a beautiful build, Vickie and Brian! We wish your wedding guests joy and love up in the trees.